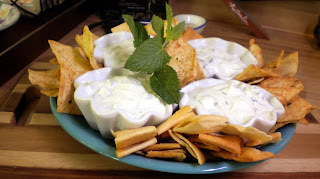 Here is my version of the Greek Tzatziki sauce. I like to use a little more Greek yogurt than sour cream, fresh herbs like chives and mint and English cucumbers because I think they are a more flavor addition! In no time at all you can make yourself a pretty fancy set up with this dip if you are having unexpected company. I had expected company so I took a little extra time on my presentation and hope everyone enjoyed how it looked as much as it tasted! By dinner time the dip was almost all gone and everyone was full, so do not make too much of this dip if you are cooking up a large meal! Enjoy! Whisk together ingredients in a medium bowl and chill until ready to use. Serve with pita chips, hard bread pieces or over gyros. Enjoy!